A Padlocked Shed, Hooks of Cold Steel -- a Maniac on the loose! 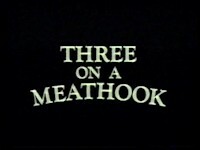 Not only is Three on a Meathook unable to live up to its title, but the name also doubles as the film’s money shot. So if you imagine three corpses dangling from a meathook in your head right now, you’ve seen the best William Girdler’s backwoods sleaze show has to offer. Getting to the image in the film itself takes a little bit more effort, as you have to slog through about an hour of tedious courtship between a farm boy and a barmaid; yep, somehow, a movie called Three on a Meathook is more of a drama than an exploitation film, only it’s hardly dramatic. The farm boy is Billy Townsend (James Pickett), a good-natured yokel who can’t be around girls. See, according to Pa Townsend (Charles Kissinger), bad things happen when he tries to make their acquaintance--homicidal things, even. Despite this, Billy helps out a quartet of girls stranded in the woods and brings them to the Townsend stead out in the middle of nowhere. By the time day breaks, Pa’s words have seemingly proven true again, as all four girls have been slaughtered. Luckily, Pa is pretty open-minded and agrees to clean up the mess while Billy goes out to drown his sorrows in a local bar, where he meets Sherry (Sherry Steiner). These two listen to bad gold sounds of the 70s while Billy struggles with the fact that he might end up tossing Sherry on a meathook at some point. Or will he? Billy coincidentally has no memory of these atrocities he’s supposedly responsible for, save for a fuzzy (literally--the camera lens is all gelled up and everything) memory of his father discovering a girl he killed when he was a young boy. We also conveniently never see who exactly kills the four girls in the beginning, and Pa Townsend and Billy are awfully proud of the family meat, whose secret ingredient was spoiled the minute Girdler settled on Three on a Meathook as a title. Sure, there are some particulars to be worked out (and one of them is a whopper of logic-stretching), but the big “twist” is so obviously telegraphed that Girdler’s incompetence is nearly charming. Nearly. It’s a little hard to forgive him for botching the awesome, somewhat ahead-of-its time concept of mashing up hayseeds and Psycho (which just takes us right back to the source in Ed Gein). The first fifteen minutes of Three on a Meathook are pretty good as far as backwoods hack and slash goes--the four girls were boating (and we see Billy kind of looming in the background the whole time) before breaking down in the middle of some deep, thick woods that are impenetrably dark presumably because Girdler couldn’t afford lighting (but it works!). Casa de Townsend isn’t much less foreboding and is surrounded by all manner of shacks and junk heaps; in many ways, it feels like an extremely rough draft for The Texas Chain Saw Massacre, as it carries that same sort of grungy, sweaty rural nightmare aesthetic. It culminates in a rapid fire sequence that’s actually more explicit than anything found in Hooper’s film, as the girls are shot, stabbed, and even beheaded with crude but effective gore effects. The hangover from this high is vicious, though, as the film begins to assault you with terrible acting, interminable dialogue scenes, and incessant harmonica bars and wah-wah riffs. Occasionally, something absurd happens, such as a conversation where Sherry’s friend discusses a past-life experience involving a dead lover who was sent off to war, but it’s a tough row to hoe until Sherry is sent fleeing from the house and stumbles upon the shed housing the titular array of Townsend meat. At that point, you’re just a Psycho-inspired denouement away from the merciful end of Three on a Meathook, which feels much longer than its 80 minute runtime. Girdler got much better at this sort of thing and looked to be hitting stride with films like Grizzy, Day of the Animals, and The Manitou before his unfortunate demise in 1979. Three on a Meathook was his second film, and, while I don’t think many of his films were technical masterpieces, this one is an especially roughshod patience-tester. It’s a film with two great bookends and nearly nothing in between, filled with more padding than a shoe store and more bad music than a Waffle House jukebox. This is a case where the prototype is much less satisfying than its more accomplished contemporaries like Deranged and The Texas Chain Saw Massacre. If you’ve ever seen its trailer on a trailer compilation, your interest has probably been piqued just as mine was when it popped up on Mad Ron’s Prevues from Hell. It’d be easy to just revisit that for the best stuff, but that’s a cop-out--Three on a Meathook is a bad movie, but one whose wildly inconsistent tones make for a bizarre, off-kilter experience--it’s got just as many awkward conversations as it does actual meat-hookings. 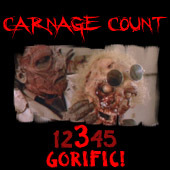 Despite its infamy, it’s never made it to DVD for whatever reason, at least not officially--there’s been a couple of releases that look to be unauthorized, with the latest coming from Grind Global Media, who tossed it onto a disc with Flesh Feast. The transfer is an obvious VHS rip that’ll have you reaching for that phantom tracking button on your DVD remote, as the quality sometimes warbles; it’s hardly ideal, but it kind of is ideal since the low-rent quality of it all lends itself to the shoddy presentation. Still, it’d be nice to see this and Abby finally get a full restoration and official releases. Girdler was a burgeoning auteur, and I wonder what he would have cooked up had he made to the 80s; Three on a Meathook isn’t his most flattering work, but it’s proof that sometimes a movie’s worth watching for a handful of scenes. Rent it!